French toast doesn't get any simpler than with an eggnog batter and the results are utterly decadent. This last Christmas we broke tradition and joined the odd band of people who took to the desert for holiday camping. Not wanting to completely abandon a festive mood, I wanted to serve special but also simple meals. For breakfast, eggnog French toast fit the bill. After ten miles of morning hiking we returned to camp with strong appetites and made this for a late brunch. I used thick slabs of French bread and topped it with blackberry preserves and a snowstorm of powdered sugar. The results were delicious and nobody regretted that I doubled the recipe. Eggnog makes an interesting batter for French toast. It's usually made with whipped eggs, milk, heavy cream, sugar, cinnamon, nutmeg and rum. My go-to French toast recipe is all these ingredients minus the heavy cream, sugar and rum. When using eggnog for the batter, we can expect a richer, sweeter and more fragrant result. 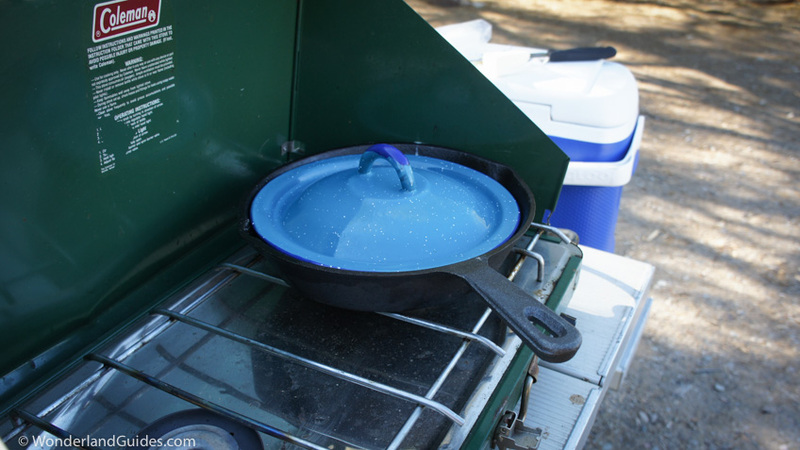 Something I try to avoid in camping meals is packing and mixing a lot of ingredients in the field. I'm always looking for shortcuts that deliver a big return for the effort. Using complicated single ingredients like eggnog can add a layer of complex flavors that impart a sense that a lot of work went into a dish. I this case, a lot of work did go into the French toast, but at the eggnog factory and not in my camp kitchen. 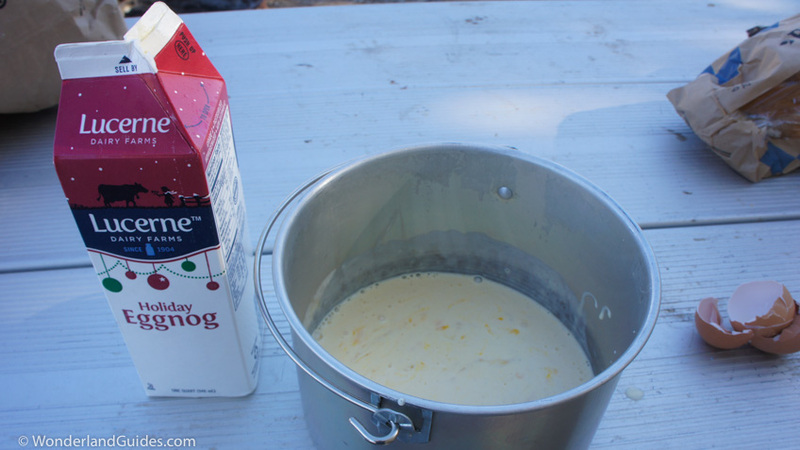 For this reason I've added eggnog to my list of good ingredients for camp cooking (when you have a cooler). 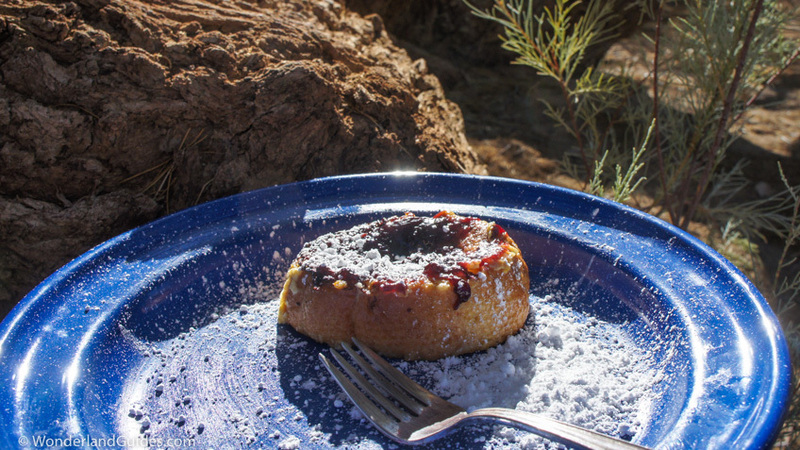 Since French toast works best with stale bread, this recipe is well-suited for several days into a camping trip. Before the eggnog elitists wrinkle their noses at my choice of eggnog, let me say the following. I was in a rush before our trip and picked up a carton of Lucerne eggnog because it was the only offering at the store. With wine, I only cook with wine that I also deem drinkable, so the same should be true for eggnog. Over in eggnog land, there are arguably tastier options than Lucerne. I think it just barely clears the net when it comes to being drinkable. In other words, I wouldn't serve it to guests, but I'd probably guzzle a glass alone in the dark. But for the French toast, I have to say the Lucerne eggnog worked pretty well, kind of like how a marinara can prop-up a bottom-shelf chardonnay. I'd use it again, but I might also consider other options since this recipe will leave you with enough leftover eggnog to have you tasting eggnog burps all afternoon. Slice thick slabs of day-old French bread. Measure 1 cup of eggnog for each 4 slabs of bread and add to a bowl or deep dish. If you like eggy French toast, you can optionally beat in 1 egg for each cup of eggnog. I tried batter both with and without added eggs, and it didn't make much of a difference in the taste. The thinner (eggless) batter saturated the hard slices of bread faster. Add the slices of bread to the batter and let them soak for about a minute on each side until they become saturated. You may need to go longer if your bread is hard. 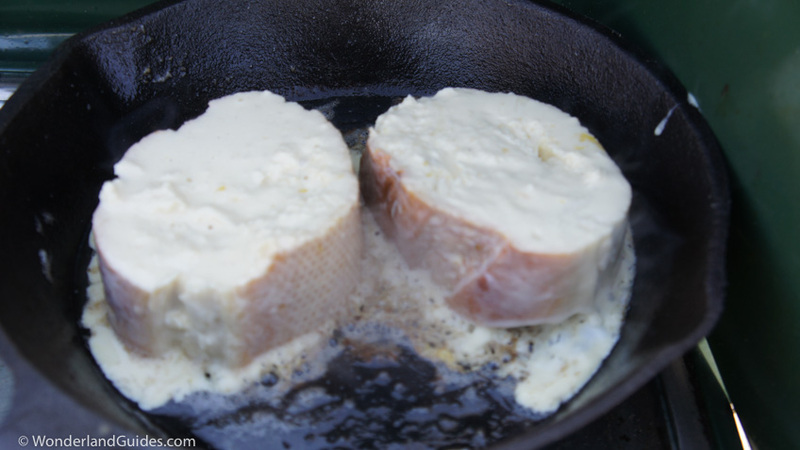 Drop some butter on a medium temperature skillet. The thicker the slices of bread, the lower I like the temperature to be. This way I can cook the bread through all the way without burning the surface. Here I used medium-low heat and covered the pan with a lid to help heat the bread through evenly. Cook each side until it's golden brown, about 2-5 minutes depending on the temperature of the pan. Add your favorite toppings and serve promptly. 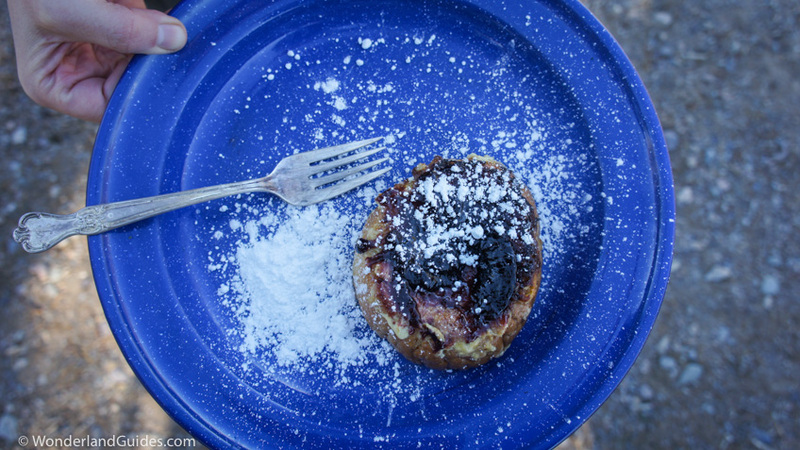 I used a dollop of blackberry preserves and powdered sugar since those pack into the field a little easier than maple syrup. The result was a rich and fragrant French toast with a shiny, sweet and sticky (almost glazed) crust. Cooking for a long time on a low heat rendered the inner part of the toast almost like a custard or bread pudding. It was a delicious meal that I will definitely be making again. Soak bread in the batter for about 1 minute on each side, until it completely saturates through. 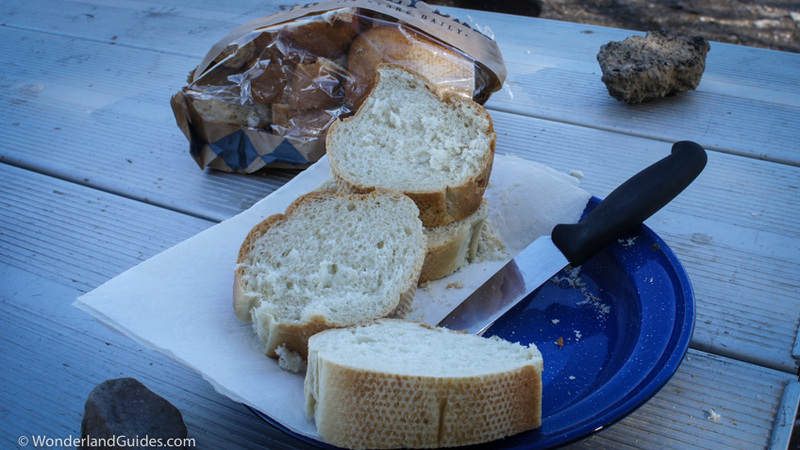 Tip: stale bread holds together better than fresh bread in the batter, which is why it's preferred for French Toast. Add a pat of butter to the heated pan and then add the battered bread. Cover with a lid. Fry each side until it is golden brown, about 2-5 minutes per side. Add your favorite toppings and serve hot.